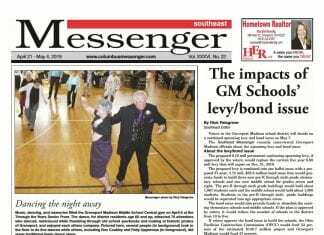 Home Southeast Messenger Halloween in Groveport is amazing! Halloween in Groveport is amazing! 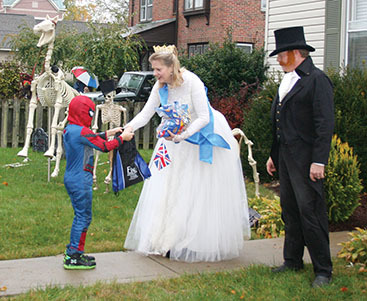 England’s Queen Victoria and internationally famous horse trainer John S. Rarey of Groveport handed out candy to trick-or-treaters at this house on Front Street. Rarey even brought along the ghost of the famous stallion, Cruiser, to help out. 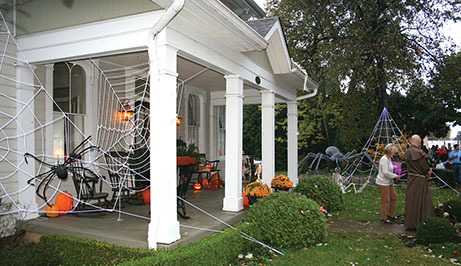 Costumed trick-or-treaters were everywhere and many homes – especially those on Front Street – featured elaborate Halloween displays. The gray, drizzling rain helped add to the spookiness of the Halloween night atmosphere. Fiery jack o’ lanterns lit the night. Mysterious smoke billowed. Eerie lights created frightful visages. Graveyards sprung from normally manicured front lawns. Skeletons lurked about. There were so many inspired and creative costumes. I saw werewolves, superheroes, dinosaurs, ghosts, green-skinned goblins, space aliens, a mad scientist, witches, and all sorts of baffling monsters. There were also people dressed as rabbits, flowers, and other assorted pleasant things as well. 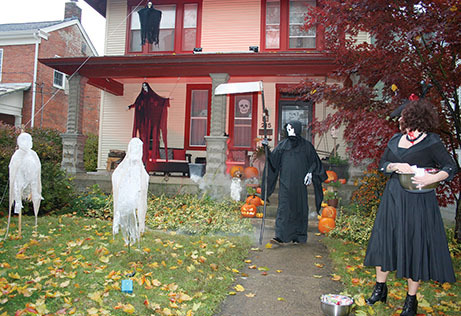 The Grim Reaper strolls out from this house to beckon trick-or-treaters to dare enter this scary scene to obtain treats. 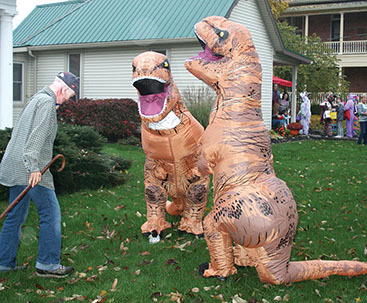 The costumed “cranky old man” character at left jokingly orders these two dinosaurs to, “Get off my lawn!” at this house on Front Street. 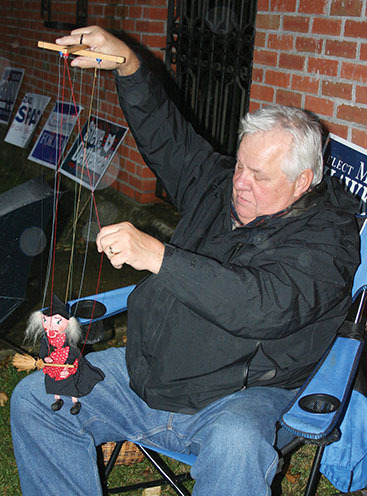 Charlie Marlatt entertains trick-or-treaters with his puppet, “Witch Hazel,” in front of his Main Street house. 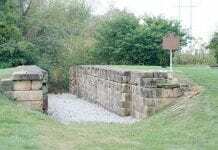 Groveport Police Sgt. Josh Short is unfazed by the fact a huge brown spider is crawling up the front of his shirt! 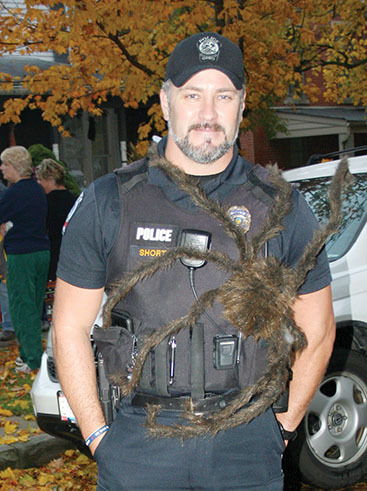 Huge spiders took over the Thomson house on Front Street! The annual Halloween block party on Front Street drew a big crowd and remained festive until it was time for the creatures that go bump in the night to fade away for another year. Thank you Rick Palsgrove for all the exciting photos that showed the Halloween Festivities In Groveport. I recently moved and couldn’t attend. The photos and the write up made me smile. I will be there next year for sure dressed in Halloween spirit.